Every time I watch Remember the Night, I am amazed. It’s so unlike anything else Preston Sturges ever did, and the story goes that he was so furious with how director Mitchell Leisen butchered his script that he demanded to direct all his films. He would go on an unmatched streak of brilliant romantic comedies, blazing through Christmas in July, The Great McGinty, Miracle at Morgan’s Creek, Palm Beach Story, Sullivan’s Travels, and The Lady Eve all in just a few years. Then, as quickly as it had come, the streak would be over. Sturges would be an angry burnout after directing the disastrous football movie, and would leave behind just this handful of films that both define and defy the romantic comedies of the 30s and 40s. I’ve watched this film once every year for as long as I can remember. Call it twenty times. I’ve come to the conclusion that either Sturges never understood what Leisen accomplished with Remember the Night, or he was just burning to direct and took issue with Remember only as a ploy. It is the best film Sturges helped make, although I would hesitate a long time before ranking Remember the Night, The Lady Eve, or Palm Beach Story. They are peers in excellence. But Remember the Night stands apart, a strangely honest and heartfelt film from a writer, and later director, who made such self-conscious films. Sturges never stooped to meta-filmmaking preciousness, but he loved to rap his knuckles against the fourth wall. His characters weren’t real people but the caricatures of a brilliant cartoonist. He played with words and loved to share the fun he was having with his audience. His situations were absurd: card-sharks and con artists traveling on the same ocean liner as a renowned herpatologist / brewing fortune heir. Remember the Night doesn’t have the same absurdist streak. It opens with Deputy DA John Sargent (Fred MacMurray) called to a trial on the day he is supposed to travel home from New York to his family’s farm in Indiana. 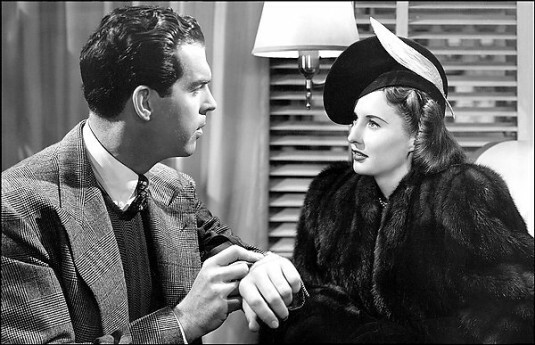 He finds himself prosecuting Lee Leander (Barbara Stanwyck), a career criminal who is looking at her third conviction. Her lawyer plays on the jury’s Christmas spirit and bottomless credulity and is on the cusp of securing an acquittal, so Sargent holds the case over until the New Year. Feeling bad about having used a procedural trick to keep her in jail and deny her an acquittal, Sargent has a bondsman friend secure Lee’s release. Because she has no money and nowhere to stay, and because she’s from a small Indiana town not far from his family home, he agrees to drive her home for the holiday. The rest of the film is their week together before the trial resumes. Sturges’ script is preoccupied with deeper questions than most of his other films. Sargent and Lee come from almost identical backgrounds and experiences. Yet one of them has become a successful attorney and the paragon of honesty and decency, and the other has become a small-time crook marking time until the state finally locks her up and throws away the key. Why did their paths diverge so starkly? How much responsibility does she bear for the way her life has gone, and how much credit can Sargent claim for what he’s accomplished? He doesn’t, and that is what blinds him. As they head into Indiana to see her family, Lee tries to explain that she and her mother parted on very bad terms but Sargent’s response is simple: “Of course she’ll be glad to see you. She’s your mother.” Anyone could look at Lee’s face and know that it’s not that simple, but Sargent can’t because he just assumes that all mothers love and forgive their children. The scene where he and Lee meet her mother is one of the all time great moments in American cinema, a sequence of prairie gothic that evokes the later Night of the Hunter. As Lee’s mother, a hard-faced woman straight out of a Dustbowl photograph, relentlessly tears into Lee for being a lifelong sneak and a liar, you can see the understanding that is finally striking John Sargent. Lee’s family is the polar opposite of Sargent’s. Both poor Indiana farmers, Sargent grew up surrounded by love, security, and the sense of opportunity they afford. Lee was ground down by the hardness of country living and her mother’s unrelenting, self-righteous misery. Her mother was the grim prairie zealot, choosing to live in near misery and squalor but making a special point to set aside money for the church mission, while setting aside neither money nor affection for her child. Sargent comes from an idealized America where things are as they should be. What Sargent comes to understand is that while Lee might be guilty of many crimes, she is also a victim of crimes and circumstances for which the law affords no protection.